Yesterday was a really relaxed day. I slept in until almost noon and then Jess, Shayla and I went to Pixar for lunch with Reid. We ate yummy food and I met a few of the people Reid works with and got to see his office. After that Jess and I had talked about going into San Francisco to do a little yarn shopping for me, but we decided to wait until today when Reid could come and we went to Ross for a bit instead and then back to their apartment. The rest of the day was just chill. We all played on computers (Ding my hunter is 77 now!) and watched Jeopardy. Jess made home made soup that was amazing and after dinner we drove to Pleasant Hill to go to Dairy Queen. After that it was back home, more computers, and then bed. This morning Reid and Jess had a planned workday at their church to fix up the mothers’ room and so that is where we started. After a couple of hours, the room was much less spidery (yep, seriously, there were spiders and spider webs everywhere in there) and a lot more inviting. We left from the church and went into the city on a quest for some souvenir yarn for me. 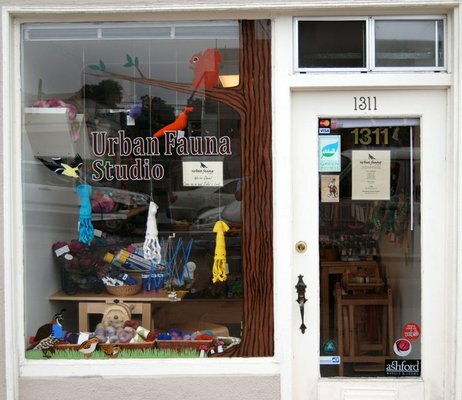 I had spent some time looking up stores online and decided on a little place called Urban Fauna Studio. The shop was really cute; literally a hole in the wall. There was barely room to move around inside, but the yarn that they had was gorgeous. It was mostly hand spun or hand dyed and I found some locally dyed yarn (dyed by the wife of the owner actually) in pretty shades of purple that I decided to pick up along with some California birch dpns. It was a good stop. After we were done at Urban Fauna we decided to go to another shop that I’d seen while doing my search called Imagiknit. I’d originally decided on the first shop we went to because it looked smaller, less commercial, and it specifically advertised local and hand spun yarns. All of those things were true about it. However, Imagiknit was amazing too. It was GIGANTIC! Two enormous rooms floor to ceiling with yarn. It was right in the hart of the Castro which made it a little more colorful than the previous place that we’d been and although I didn’t buy anything there, I was glad we’d gone. Over the course of the day, Jess decided that she needed to buy yarn and learn how to knit. Of course, there was no way I could say no to teaching her and I *may* have even done a little bit of nudging her in the direction of learning. (She is currently sitting next to me, working on her very first scarf in a bulky alpaca, and doing a fantastic job!) Anyhow, Jess bought some yarn at Imagiknit and I think she maybe caught the bug known as fiber addiction. After we got done meandering through knitting shops, we headed to a lookout that is a favorite of my hosts and we spent some time just taking in the city below us. Guys, I love this place. I can’t stress enough how much it feels like home and how much I wish I could just up and buy a place to live here so that I could visit whenever the whim strikes. There is nothing like San Francisco and the bay. There is nothing like the hills and the trees and the wind and the fog and the fact that you can be warm one minute and freezing the next. It is absolutely the perfect place. There is so much history and so much present and so much future all wrapped up into one big but little city. The houses are stacked on the hills in neat rows with little shops underneath them to peruse. There are people everywhere and, I can’t stress enough how amazing this is to me, there is so much diversity. Diversity in culture, ethnicity, religion, creed, belief, appearance, absolutely everything… well, everything except the fact that everyone seems to be obsessed with the Giants. It was still almost impossible to go a block without seeing at least a dozen people in orange and black today. This, my friends, will always be my city.